The Romans called the main peak above the Pass road Mons Jovis (Mount Joux or Mount Jupiter) after the god of thunder Luppiter Poeninus. A temple was built to this god between the reigns of Augustus Caesar in 12 BCE and Vespasian in 72 BCE on the summit along with a refuge for Imperial envoys and legionnaires traveling through the Pass. The temple complex was the highest ever built during the Roman Empire and survived into the 14th century when Theodosius the Great destroyed it. Seven hundred years later, many of the temple stone blocks were used by Saint Bernard and his monks in the construction of the original monastery buildings. This was a much traveled pass route over which Roman armies, officials, clerics and travelers have walked or ridden. 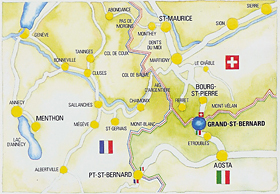 Charlemagne crossed the Great St Bernard pass in 800 CE after his coronation in Milan as emperor. Many later kings including Frederick Barbarossa (1162 CE) crossed here. Napoleon (1800 CE) led an army of 40,000 across this pass into Italy and the battle of Marengo.